The board of education unanimously voted to lift Superintendent Jerry Weast's censorship of flyers to be sent home in students' backpacks. A federal appeals court ruled that Weast's policy of selectively choosing who could and who could not send flyers home was an illegal abuse of power. 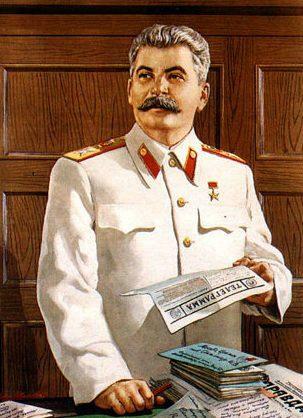 In response, Weast (pictured) banned all flyers except those issued by government entities. He even banned his nemesis, the PTA. WUSA-TV Channel 9 reports, "Superintendent Jerry Weast had halted the practice after a court ruling which said it was unconstitutional for local leaders to pick and choose what gets sent home with students. "The PTA was really upset about it - saying it cut off their lifeline to parents. "After Wednesday’s unanimous vote, the backpack stuffing can resume." In an orchestrated media event, County Executive Doug Duncan and Superintendent Jerry Weast appeared before the TV cameras at Walter Johnson High School to mark the new academic year. Duncan prides himself as a big booster of the county's fine public school system. But apparently the schools aren't good enough for his own family. Before going to the orchestrated photo-op at Walter Johnson, Duncan quietly dropped his daughter at a private high school in Kensington. The Washington Post ran a page-one story about the media event. 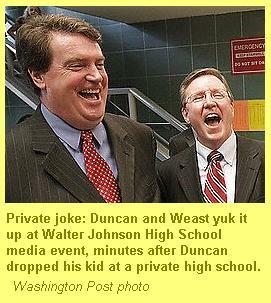 A photo editor appeared to note the irony, running a picture (detail above) of public school champion Duncan yukking it up with Weast after his private-school detour. Weast told Walter Johnson students that Duncan is like a "king." Isn't it funny how Superintendent Jerry Weast seems to be available always for carefully-orchestrated media events and to take credit for good news, but is unavailable for comment when the Washington Post calls to ask him about things that make him look bad? Or how he'll go to places like Walter Johnson High School where the scripted agenda heaps him with praise, but won't go to Seven Locks Elementary School where parents and kids want to ask him tough questions? Remember how he wimped out of the Kendale hearing a few months ago? That says a lot about his character. People who opposed the County Council's deal to hand over public school property to crooked lobbyist Jack Abramoff are anti-semites, according to County Councilman Steve Silverman. A reader has provided JerryWeast.com with a link to a 1999 Gazette story about how Silverman, Councilman Michael Subin and others conspired to turn over the 20-acre campus of the former Col. Joseph A. Belt Junior High School to a group later revealed to be dominated by Abramoff, sentenced for felony crimes in 2006. As the Washington Post reported earlier this year, Abramoff had directed campaign contributions from Pacific sweatshop interests to County Executive Doug Duncan's campaign shortly before Duncan made the controversial decision to provide public school property to a religious school. According to the April 7, 1999 Gazette, Silverman "accused some opponents of Belt's sale to Yeshiva of being anti-Semitic." "Silverman also lashed out about those who accused Councilman Michael Subin (D-At large) of Gaithersburg, himself and other Jewish county officials of conducting secret negotiations with Yeshiva and offering them preferential treatment so the school could move to Belt," the Gazette reported. "'It is a despicable act to suggest that people of the county are acting on anything other then good faith,' said Silverman, who is Jewish. 'I deeply resent the implication that my decision will be based on my religious persuasion.'" Silverman is running against former Councilman Ike Leggett to replace Duncan as County Executive. One of the few political differences between the two candidates is that Leggett has consistently supported a strong county Inspector General to probe allegations of waste, fraud and abuse, while Silverman has opposed it. At this point it's appropriate to remind readers that Steve Silverman trashed people in the Seven Locks community of racism because they opposed the Silverman-Duncan plan to turn their local elementary school into a mega-development project. Oddly, those "racists" include big supporters of Silverman's primary opponent, Ike Leggett. . . . In another attack on the PTA and on wholesome traditional groups like the Boy Scouts, the Montgomery County school system has banned those organizations from sending activity fliers home in student's backpacks. According to the Washington Post, "The decision comes less than a week after a federal appeals court ruled that the school system's policy for flier distribution was unconstitutional because it gave educators unlimited power to approve or reject materials." School system Chief Operating Officer Larry Bowers assures people that the ban is only temporary. Montgomery County Public Schools children may bring home only government documents, MCPS COO Larry Bowers says. His decision follows a federal court ruling that MCPS violated the United States Constitution by wielding arbitrary power over which non-governmental organizations would be allowed to send flyers home in kids' backpacks. The Washington Post reports, "Now only materials from the school system and other government agencies are allowed to be sent home. PTAs and community groups such as the Boy Scouts may display their fliers on tables in school buildings but may not send them home with students." Superintendent Jerry Weast has begun his counterattack on local Parent Teacher Association (PTA) groups. That's how parents see his total ban on all PTA literature from being sent home to children in their backpacks. The PTA at Seven Locks Elementary School and other schools and clusters in Montgomery County defeated Weast's controversial and possibly illegal plan to shut down a thriving school and build a mega-school on a wooded area that the community didn't want. Weast, his $350,000-a-year contract in jeopardy when it expires next year, is fighting to save his job. A countywide PTA leader calls Weast's move "devastating." "It's going to have a devastating effect on communication for PTAs to parents," Jane deWinter, president of the Montgomery County Council of Parent Teacher Associations, tells the Washington Post. "We're very, very concerned about this." County Councilman Mike Subin tried to bully a tree, but the tree got the better of him. He learned a valuable lesson: That he can't railroad a tree with a bicycle. Subin (pictured) broke four ribs and punctured a lung when the tree wouldn't get out of his way, according to the Gazette, and he's using the occasion to tell people to wear a condom while bicycling. The 1999 deal to provide crooked lobbyist Jack Abramoff and his cohorts with public school property for their private school has cost the Montgomery County Public Schools system millions of dollars, the Washington Post reports. At the time, County Councilman Steve Silverman ripped critics of the deal as anti-semitic bigots in an effort to silence them. The Post describes how the Abramoff group got a 20 acre piece of MCPS property in Wheaton for $1.75 million. The catch was that the Yeshiva school would pay "millions more to renovate it" and remove an eyesore from the neighborhood. But according to the Post, MCPS took back the school "to ease overcrowding" after Yeshiva had made renovations. MCPS then reimbursed Yeshiva for the renovation costs, spent another $12.4 million in further modifications, and provided another school site for Abramoff's private school. At the center of the issue is Doug Duncan aide Jerry Pasternak, who coordinated campaign contributions through Abramoff to Duncan, and who hammered out the Yeshiva deal. Looks like a Priority One subject of an Inspector General investigation. No wonder Steve Silverman is so against the county Inspector General investigating Montgomery Public School operations. The Yeshiva deal he helped engineer for crooked lobbyist Jack Abramoff has scandal written all over it. Continuing the Yeshiva story, the Washington Post reports, "The contract allowed Yeshiva to bill the full $9.9 million regardless of the renovation costs and to use the leftover taxpayer money as it wished. The school system awarded the contract without competitive bidding and waived rights to inspect the project." Richard Hawes, the MCPS facilities manager who tried to force the unwanted Kendale School project on the Seven Locks community - and who lied about important material facts concerning construction - says he has no problem with the Abramoff group bilking the county taxpayers. The Washington Post discovered that the contract allowed the Abramoff group "to bull the full $9.9 million regardless of the renovation costs and to use the leftover taxpayer money as it wished." It reported that MCPS "awarded the contract without competitive bidding and waived rights to inspect the project." That's just peachy with Hawes. "Our clear intent was to reimburse [Yeshiva] for what they had done" at the first school," Hawes tells the Post. "If they made money off of it, that's the American way." The FBI has been probing the MCPS-Abramoff school deal. According to the Washington Post, "A school system e-mail and other records indicate that FBI agents made inquiries about the construction contract in 2005. Michelle Crnkovich, spokeswoman for the FBI's Baltimore office, said that a fraud investigation was closed this year but declined to say why. "In June this year, a county official signed the Montgomery Hills lease with Yeshiva." Even though MCPS spokesman Brian Edwards says the school system had nothing to do with leasing a public building to a corrupt lobbyist Jack Abramoff's private school, the Washington Post reports that Superintendent Jerry Weast signed what looks like an insider scam. According to the Post, "On March 28, 2003, school superintendent Weast, then-school board president Patricia B. O'Neill and Cohen signed the "stipulated sum" contract for $9.8 million, which was later increased to nearly $9.9 million. The no-bid agreement waived the county's right to inspect the work, apart from standard inspections required for building and occupancy permits." When media hound Jerry Weast says he's "not available" to speak to a Washington Post reporter, you know there's a story somewhere. The preening superintendent loves media attention. But for some reason he's avoiding reporter Cameron Barr, who has been uncovering what looks like a crooked MCPS deal with Jack Abramoff and associates. Like others named in the Washington Post story on the Abramoff school deal, Weast was "not available" to give his side of the story, the paper reports. If readers would like to reach Barr with some inside information, just click here. Here's a great civics lesson for kids: Their school system, under Jerry Weast's direction, is violating the Constitution of the United States. A federal appeals court has ruled that Montgomery County Public Schools (MCPS) policy on distributing flyers for kids to take home is "unconstitutional because it gives school officials unlimited power to approve or reject materials." "In the 20-page decision, the three-judge panel of the 4th US Circuit Court of Appeals wrote that the school system's policy governing flier distribution 'imposes no guidelines as to how MCPS should exercise this unlimited discretion. This unbridled discretion requires that we sustain the [plaintiff's] challenge to the policy,'" the Washington Post reports. More arrogance from MCPS: "School system officials said it was clear that the court did not understand the intent of the [flyer]policy," according to the Washington Post. "They misinterpreted how the policy was intended to operate," MCPS attorney Judith Bresler says. "I guess we were not clear enough when we articulated it. [The ruling] is a misinterpretation of the way we meant the policy to operate."